This private and secluded recently redecorated cottage is located on the edge of the beech forest with the Black Valley Stream below. Fully fenced, close to the start of many walking tracks and just a couple of minutes from the lake edge, the Chapel and the shops. 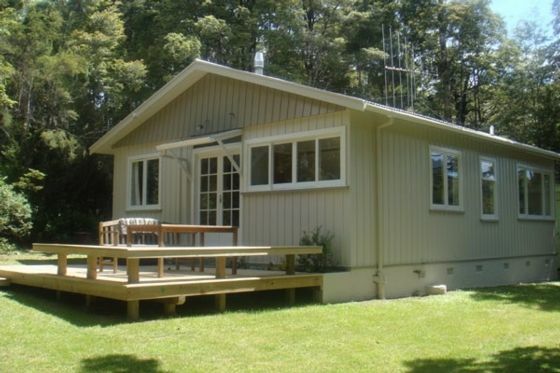 Three bedrooms, 1 double with attached toilet/basin, 1 with two bunks and 1 with two single beds. Separate bathroom with washing machine. Cosy, warm cottage with log burner fire. Two private sunny decks. Secure parking inside boundary ideal for boats with double garage available upon request. Discount for extended stays. 10% for 4 days or more not including school holidays, public holiday weekends, or event weekends. No pets. Smoking outside only (please dispose of butts thoughtfully). This property relies solely on rain water for its water supply. For this reason, please conserve water especially during dry periods. As always, I enjoyed my stay in this true to itself bach. Great location, quiet but very convenient to lake, walks and village. A nice wee place to stay for an escape. A nice wee place to stay for an escape. It had everything we needed for a short stay, was warm and clean and tidy. Perfect location, lovely and secluded. Would definitely recommend and will hopefully stay again!